LONGFELLOW, HENRY WADSWORTH (1807-1882). —Poet, was born at Portland, Maine, the son of Stephen Longfellow, a lawyer. From childhood he cared little for games, but was always devoted to reading. In 1822 he was sent to Bowdoin College, of which his father was a Trustee, and after graduating was appointed to a new Chair of Modern Languages, which the college had decided to establish, and with the view of more completely qualifying him for his duties, he was sent to Europe for a three years' course of study. He accordingly went to France, Spain, and Italy. Returning in 1829 he commenced his professional duties, writing also in the North American Review. In 1831 he entered into his first marriage, and in 1833 he published his first books, a translation from the Spanish, followed by the first part of Outre Mer, an account of his travels. 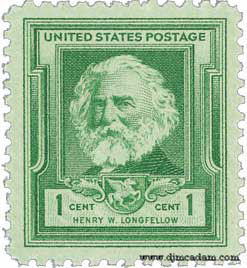 At the end of the year Longfellow was invited to become Prof. of Modern Languages at Harvard, an offer which he gladly accepted. He paid a second visit to Europe accompanied by his wife, who, however, died at Amsterdam. He returned to his duties in 1836, and in 1838 appeared Voices of the Night, containing the "Psalm of Life" and "Excelsior," which had extraordinary popularity, and gave him a place in the affections of his countrymen which he held until his death. The same year saw the publication of Hyperion. His next work was Ballads and other Poems, containing "The Wreck of the Hesperus" and "The Village Blacksmith." In 1843 he married his second wife, and in the same year appeared The Spanish Student, a drama. The Belfry of Bruges and Evangeline (1847), generally considered his masterpiece, followed. In 1849 he published Kavanagh, a novel which added nothing to his reputation, and in 1851 Seaside and Fireside, and The Golden Legend. Having now a sufficient and secure income from his writings, he resigned his professorship, and devoted himself entirely to literature. Hiawatha appeared in 1855, and The Courtship of Miles Standish in 1858. In 1861 he lost his wife under tragic circumstances, a blow which told heavily upon him. His latest works were a translation of Dante's Divina Commedia, Tales of a Wayside Inn, The New England Tragedies, and The Divine Tragedy, the last two of which he combined with The Golden Legend into a trilogy, which he named Christus. In 1868 he paid a last visit to England, where he was received with the highest honour. Later works were Three Books of Song, Aftermath, and Ultima Thule. He died on March 14, 1882. Longfellow lacked the intensity of feeling and power of imagination to make him a great poet; but few poets have appealed to a wider circle of readers. If he never soars to the heights or sounds the deeps of feeling he touches the heart by appealing to universal and deep-seated affections. He was a man of noble and chivalrous character. See also: "Longfellow’s 'Spanish Student'," by William Dean Howells.